Hi everyone. Today's card is for the March Rudolph Days. 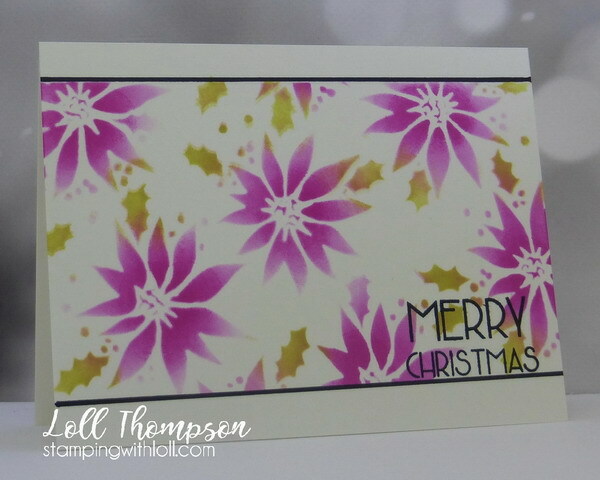 This is a quick card with sponging distress inks over a stencil (pink for the flowers, lime for the holly). No masking so there is a little overlapping of colours, but I'm happy with how it turned out. And it only took a few minutes. I added black lines with a thick black sharpie marker and stamped the sentiment in black. Amazing bright and bold colours, love your stencilling! Love your outside the box colors for this beautiful card, Loll, and your amazing stenciling. Enjoy your day! I love the gorgeous colours that you've used on this beautiful card Lol. What a very gorgeous design and such super stencilling. If I had put those lines in they wouldn't be as straight as yours. This reminds me I have a similar stencil must use it now I have seen this super card. The lime and pink are stunning together, especially with the bit of black! Love this (and I'm not a big fan of non-traditional Christmas colours!). Love the pretty pink poinsettias! And, great way to add black lines with the sharpie! Fab card!! Beautiful poinsettias and holly, Loll! Quick but delightful! Love the font of the sentiment! so pretty Loll, love the colours you used. I always love your creativity, Loll. This card is no exception. I applaud your bravery in the direct to card use of the black marker!!! I am so envious of your 'quick' and wonderful card Loll....amazing effect and what a beautiful card x.
Gorgeously stenciled holly card, Loll! You used unexpected colors and they look fresh. The black lines gives the card a finished-look. They look so straight and even that I thought you layered a black panel underneath!